After losing her left hand at only nine months old, seven-year-old Faith Lennox grew up without wanting a prosthetic one. That was until she got the opportunity to get a custom-made prosthetic created using a 3D printer. 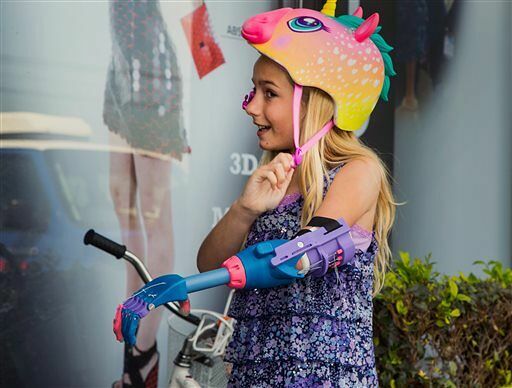 She even got to pick the colors, choosing her favorite ones—blue, pink, purple—and you can see in the video how thrilled she is with her new 'robohand.' The great thing about it is, not only is it lightweight which makes it perfect for children, but it can easily be reproduced. E-Nable provides open-source technology for building the hand, Lengsfeld said, making it economical for anyone with the right printer and a set of instructions to create one. Faith's only costs $50, and when she outgrows it she can easily build a bigger replacement. Another reason it's so affordable is that, unlike adult models, it works without expensive sensors. Instead Faith manipulates it by moving her arm back and forth, which means she can now ride her bike just like any other kid. You have to admit it does look pretty cool, i wonder where E-Nable came up with the idea from, i can't help but think i've seen it before? Now i remember, at last the mystery is solved.